Back Row from left to right: David Clish (Head Boy), The infamous Mr Phillips (Headmaster), Billy Davidson (Deputy Head Boy). Front Row from left to right: Pauline Jackson (Head Girl) and Eileen Alderson (Deputy Head Girl). David Clish became a doctor, both Pauline Jackson and Eileen Alderson became teachers, the latter appears in the Billingham Roseberry Teachers photograph on this site. I am sure there are many visitors to this site who will remember Mr Phillips unusual military style of running a school. This photograph of the head pupils at Billingham North School was loaned to me by Pauline Jackson. I don’t remember Mr Philips’ style being military! I wasn’t taught by him and actually liked him. By the time I started in 1954 (age 7, having moved from Eaglescliffe) he had a Ford Prefect. Billy Davison and Pauline Jackson later went to Henry Smith’s in Hartlepool, which is where I know them from, and I think Eileen Alderson did too. Bill’s sister Joan was in the same class as me at both schools. I don’t remember David Clish so presumably he went to another secondary school, possibly Stockton Grammar. I was head girl 1957-8. Not boasting, just saying! Philip Hunt was head boy. Our teacher was Mrs Marshall, whom I really liked. For the following two years she was my sister’s class teacher but she didn’t like her! My maiden name was Buttle. 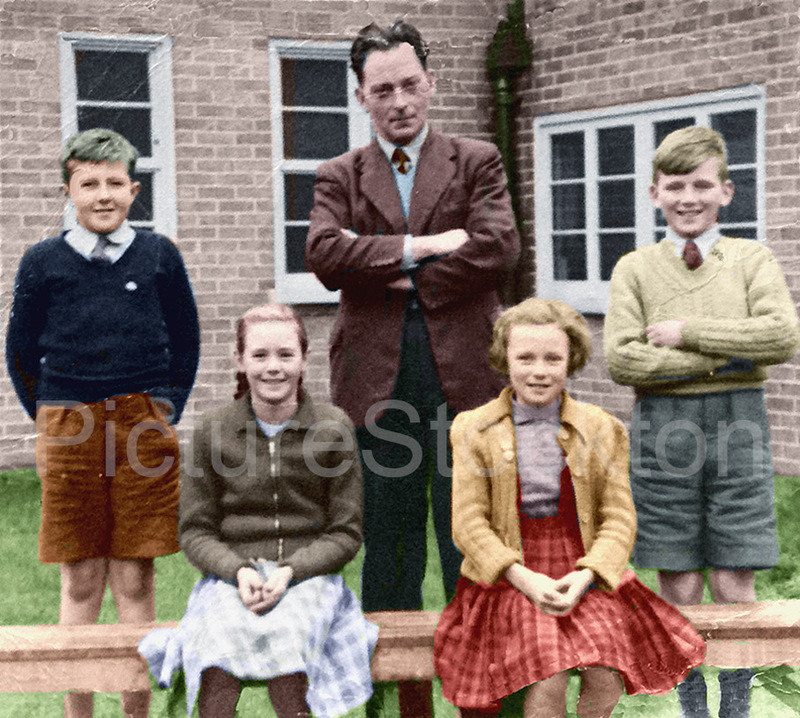 I was at the school in 1952 when Mr. Phillips was our class teacher who arrived each day on a motor bike. He terrified us each morning when he questioned the class over the times tables whilst using a wooden blackboard ruler like a gun. Woe betide anyone not listening as he regularly threw a blackboard board rubber at you. He was an excellent teacher and many in his class passed the 11 plus exam as a result. Sorry this was Colin Quinn not my wife. What became of Dr Clish? Was Eileen Alderson the daughter of the Pentland Infants teacher, Mrs Alderson? I have been in touch with Pauline Jackson and she says that Eileen Alderson’s mother did teach at the Billingham North School for a number of years, she can forward a message to Eileen if you so wish, Picture Stockton can put you in touch with me and I can then forward any message to Pauline. Pauline has no information on David Clish.